Bedford B on fire against champions-elect! Your editor managed a reasonably respectable draw with the White pieces against Peter Hunt on board 5. For Bedford B, that was easily the worst result of the evening! Bedford B braved the Beasts From the East to face Leighton Buzzard A. A tough battle was expected as LB were yet to lose a match this season. The first game to finish was Steve’s on Board 5. With kings castled on opposite sides of the board, both sides had attacking chances, but once these petered out, a draw was agreed. Being board 1 in division 1 is a thankless task, but Marc took the game to Evgeny. Out of the opening Marc won a pawn and seemed to have a good position (see game). A slight inaccuracy allowed an exchange sacrifice which then allowed Evgney to force a draw by perpetual check. With scores level, attention turned to the middle boards which seemed at one point to be turning towards the home side. Ravi and Andy Tinker were involved in a ding-dong affair in a King’s Indian. Ravi sacrificed the exchange and seemed to have good compensation for it, although he felt that it was probably not enough. Pieces were scattered around the board which made it very difficult to establish who would come out on top. In time trouble, Andy went wrong which allowed Ravi to launch a decisive mating attack. My game with Steve was an odd affair. Out of the opening I had a good edge with Steve’s king being slightly exposed. However, in the middle game I carelessly lost a pawn (forgetting that bishops can take forwards!! ), although it probably did not fundamentally alter the position. Steve managed to neutralise my active pieces and go into a queen and rook ending which was winning, but a blunder to allow me to win a rook and the game. 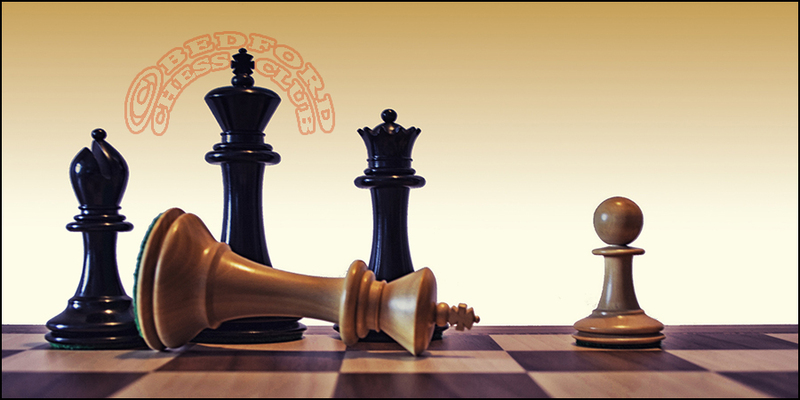 The final game saw Richard playing a closed Sicilian against John Sharp. Richard always looked to be at a slight disadvantage as John had pressure down the queenside, although it did not look decisive. Hanging grimly on to the time control things seemed to worsen for Richard, but John then seemed to forget the time control limit and inexplicably lost on time in a much better position. An emphatic 4-1 victory for the B Team, however it could easily have been the other way round. Overall, one of Bedford B’s best performances for many a season – second place here we come! Brilliant result all round, against a seriously higher rated team. Well done guys.